Code-cracking teens hack into @BMO ATM « Adafruit Industries – Makers, hackers, artists, designers and engineers! Caleb Turon (left) and Matthew Hewlett hacked a Bank of Montreal ATM and then alerted bank staff to the vulnerability of the ATM. The 14 year olds were late returning to school from lunch, but had a note from the bank indicating they were helping with security. (Chris Procaylo/Winnipeg Sun/QMI Agency). Code-cracking teens hack into Grant Avenue ATM. A couple of 14-year-old computer whizzes have the Bank of Montreal upgrading their security measures after they hacked an ATM machine. 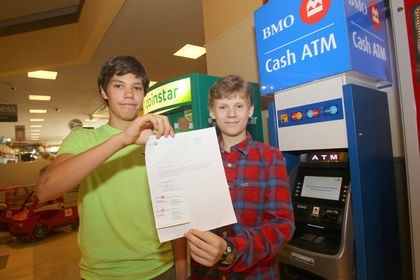 Matthew Hewlett and Caleb Turon, both Grade 9 students, found an old ATM operators manual online that showed how to get into the machine’s operator mode. On Wednesday over their lunch hour, they went to the BMO’s ATM at the Safeway on Grant Avenue to see if they could get into the system. That’s pretty cool, the kids got a note from the bank, not a jail sentence.